I’ve broken my unblemished record and am currently wallowing in self-pity in my sick bed. As well as being LAME, I’m also not feeling particularly inspired to write about much – it’s early January, what is there to say? 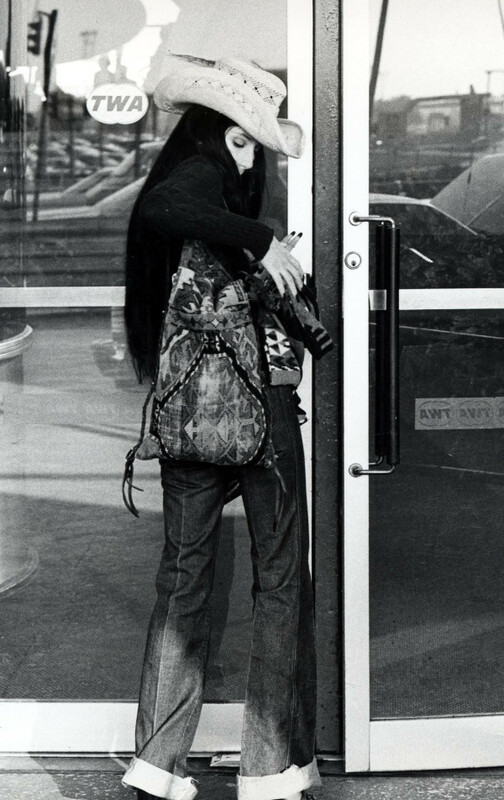 So, here’s a nice effortless post – a picture of Cher arriving at the airport in 1974, found on Stylelist. Much better than all the unsuitable shoes, bare legs and frivolous handbags that pass for sensible flying gear these days. Special mentions for the pointy black nails and aztec backpack – what a guru. On the subject of flying, here’s a quick reminder of my favourite ever airport picture – Victoria Beckham with a hangover, struggling to board a plane. Gurl. Previous Post Daisies comes to the big screen!